Kayla | Labrador Retriever in Beaconsfield. Kayla is a Labernese. She is half Labrador, Half Bernese. But she is much more Lab because she loves to get the ball & catch the frisbee! We have to be careful because she does not realize she is 8 years old, so if she does too much her legs hurt. She loves long walks & happy people. I am a Communication & video Coach, so I make videos for websites & social Network to boost businesses. I studied at Concordia in politics, I wanted to be a diplomate (LOL). 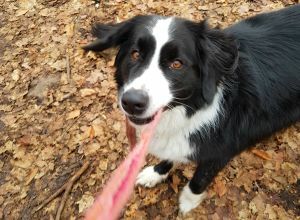 I am also a mom, a cook, a wife, an entertainer,...so I do not have enough time in a day & I feel sad because my dog needs a lot of exercise, she looves people & loves to be outside.